Team members work behind the scenes operating the Sound Boards, PowerPoint presentations at both the 8:00am and 10:00am Services. Team members live stream the 10:00am Service to the Internet. Microsoft PowerPoint or EasyWorship software is used to present videos, DVDs and internet-based video for Sunday Services. Team members operate two cameras in the Sanctuary to stream 10:00am Sunday Service to the Internet. They also make sure microphones are working at each service allowing people to hear minister, musicians and worship assistants. Video Presentation and Live Streaming: The PowerPoint presentation used for the Sunday service is created by someone outside the team. The team presents it using EasyWorshop software or PowerPoint on Sunday morning. Sunday Stream software is used to stream the 10:00am Service to the Internet. Team members should be comfortable with basic personal computer used, although they need not have highly-technical computer skills. A team member will train you on actual use of the software. Sound Boards: Each Service has its own sound board and video presentation computer. 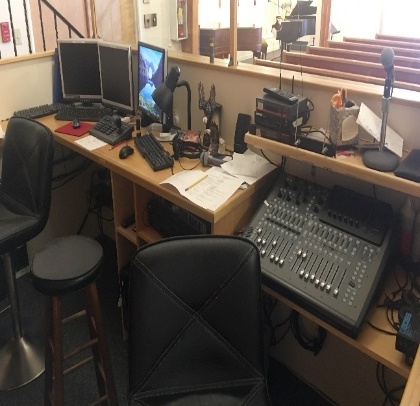 You will be trained to use the sound equipment and will have plenty of mentoring to make sure are successful in providing this vital service on Sundays. The 10:00am Service one person operats the Video and Live Streaming and another on the Sound Board. The 8:00am Service one person operates the Video Presentation and Sound Board. Time commitment is two hours, one Sunday per month (less often with more team members). Members arrive at the church no later than one hour prior to the service to set up. As with all the teams, part of the team commitment is to be available for training and a general volunteer meeting once per quarter.